The change was too conspicuous to miss. A subtle message of handing over of the baton albeit in a gradual manner, initiated last year at Jaipur, appears to be a work in progress and the glint of pride in Congress president Sonia Gandhi was evident today. The BJP today described the Congress manifesto a document of “deceit” and questioned the growth story of the party that led the coalition government at the Centre for the past 10 years. The industry has welcomed the Congress manifesto released today for its focus on the aspirational vision and inclusive growth. But it pointed out that economic health cannot be ignored. BJP’s Prime Ministerial candidate Narender Modi today urged voters to elect a ‘Congress-free’ government. Addressing a gathering in North-East Lok Sabha constituency, Modi said Congress had always betrayed Muslims. While interim orders by the Supreme Court allowing armed forces personnel and their families to register as voters at their place of posting in peace stations has added a fresh dimension to the political calculus in 318 constituencies, the military areas would be off limits to political campaigners and vote seekers. The Apex Court's March 24 order explicitly states that the Election Commission “shall be within its power to issue guidelines prohibiting campaigning in peace stations”. As she sat on the stage hearing her son Rahul Gandhi deftly tackle posers at a media conference after the release of the manifesto, the Congress president appeared spellbound. It was clear both in the presentation and the passionate manner in which Rahul drew the contours of the vision the party has for the country preparing to elect a new government, that he has travelled some distance. Be it the questions on the BJP's PM candidate, opinion polls, inclusiveness and growth model, Rahul did most of the talking. While the last word came for Sonia in her capacity as the party president, the manifesto and the work that went into preparing the document was packaged as one with a distinct Rahul Gandhi’s imprint, a point that chairman of the drafting committee AK Antony emphasised. 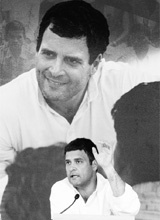 A video clip showcasing consultations Rahul held across the country over the past five months with different groups in taking inputs for the manifesto was intended to convey that for the first time, the party adopted a bottom-up approach instead of “behind-the-close-door” top-down drafts. For the first time, the Congress through its vice-president Rahul Gandhi engaged various stakeholders, including the skilled labour class community, to draft its manifesto. Over 10,000 people participated in the discussions held at 27 locations. “We have taken the manifesto drafting process out of closed doors to the people,” Rahul said. Party spokesperson Ravi Shankar Prasad said the manifesto was a “document of deceit, an insult to the people of India and rubs salt into their wounds. The entire manifesto appears to be devoid of credibility and lacking seriousness”. Prasad maintained that as against the promise of 8 per cent plus growth, the real growth stood at 4.6 per cent. “Can there be a greater fraud?” he said. Scoffing at the Congress promise of creating 10 crore jobs in the next five years, the BJP referred to National Sample Survey data showing that during the BJP-led NDA government at the Centre, it created 6.7 crore jobs as against 1.5 crore jobs during the UPA regime and just 27 lakh in the first five years in office. He said for a government that has been rocked by scams and scandals and hit by policy paralysis, the Congress should take the blame for rank mismanagement of the country and its economy. Welcoming the manifesto in a statement, CII president Kris Gopalakrishnan said the rights to health, pensions and housing were three major initiatives promised by the Congress which will go a long way in ensuring inclusive growth. CII said the manifesto had pledged to restore India's 8 per cent plus growth rate within three years and boost manufacturing to 10 per cent. It could be done by ensuring a globally competitive business and investment-friendly environment. CII added that the manifesto had committed to introduce the Goods and Services Tax Code Bill and a new Direct Tax Code Bill in Parliament and ensure that they were enacted within a year. FICCI president Sidharth Birla said the Congress manifesto provided an aspirational vision on the economic front. "The inclusive growth is imperative. However, the wide variety of rights must be only based on sound economic health of the country. FICCI awaits an evolving road map in due course", he said. Assocham also welcomed the manifesto, saying it aimed at economic growth and uplift of SC/ST and weaker sections. The Centre has been directed to give details of peace stations to the commission within two days. Armed forces’ families in the remaining 225 constituencies where the voter lists have already been complied may be left out of the poll process and may have to make do with the traditional postal ballots. Poll-related activities are expected to be witnessed in the 62 cantonments across the country like Ambala, Delhi, Kasauli and Secunderabad where a sizable civilian population co-resides, though such activities would be outside military premises. Chief of the Army Staff Gen Bikram Singh visited Israel. Last week, Gen Bikram Singh was welcomed at Camp Rabbin in Tel Aviv. During his visit, he met the Israel Defence Forces' (IDF) Chief of the General Staff, Lt Gen Benjamin Gantz, and the Commander of IDF Ground Forces, Major General Guy Tzur. The military meetings focused on the cooperation between India and Israel. Gen Bikram Singh also toured Israeli military bases and was briefed on operational procedures. Assam Rifles troops march down Rajpath on Republic Day. 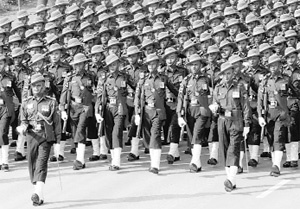 It is as far back as March 1935 to which India's oldest paramilitary force, the Assam Rifles, traces its birth. It was raised by the British 179 years ago as the Cachar Levy with a strength of 750 men to guard the plains of Assam from the unruly tribes inhabiting the surrounding hill tracts. The force has since undergone a number of changes before the name Assam Rifles was finally adopted in 1917. It has participated in the two World Wars as well as post-Independence wars and major operations. Popularly known as "Friends of the Hill People," the force, with its 46-battalions, is mandated for the dual role of internal security in the north-east as well as guarding the Indo-Mayanmar border. At present, its Director General is Lt Gen Ranbir Singh, a foot soldier from the Bihar Regiment and an alumnus of the Lawrence School, Sanawar near Chandigarh. The Ministry of Defence is in a "silent mode" since the Model Code of Conduct was enforced for the General Elections on March 5. Even the launch of long-range underwater-fired nuclear capable missile on March 24, a big event that would have had the MoD even issuing pictures of the event, was a low-key affair with conformations coming only with a static “yes” and followed with request "please do not quote anyone from the MoD." On a normal day without the code being in place, such a launch would have led to a formal announcement.